For the 2018 model year, the Lincoln MKX changes little aside from newly available paint colors and several additional apps for its Sync 3 infotainment system. Updating for the 2019 model year includes a fresh design direction, along with a name change: from MKX to Nautilus. Lincoln offers the 2018 MKX in four trim levels: Premiere, Select, Reserve and, topping the lineup, a Black Label edition. All versions come standard with a 303-horsepower 3.7-liter V6 engine and front-wheel drive. All-wheel drive is an option. So is a twin-turbo 2.7-liter V6 that develops 335 horsepower and 380 pound-feet of torque. Though robust, the twin-turbo engine falls short on frugality. A 6-speed automatic transmission mates with either engine. Conservatively shaped but handsome sheetmetal strives to conceal the Lincoln crossover’s close relationship to Ford’s Edge. Taken as a whole, the MKX can be seen as a contender rather than the visual champion in its category. In addition to more features and luxuries, the Black Label edition includes some uncommon perks, such as free car washes and an annual detailing of the vehicle. Only the Lincoln model comes with an adaptive suspension, including three driving modes. 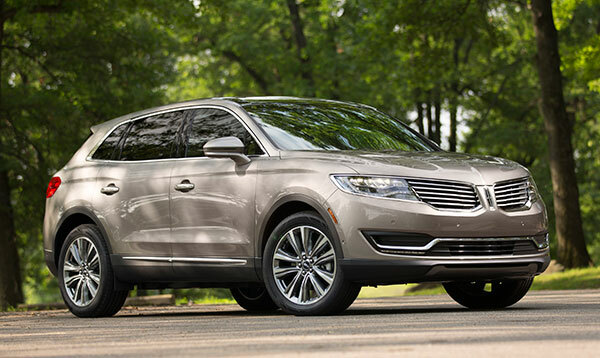 Lincoln limits such advanced safety technology as automatic emergency braking to Reserve and Black Label trim levels. Bundled with other collision-avoidance features, it’s an expensive option. The MKX earned Good scores on crash tests performed by the Insurance Institute for Highway Safety. A Superior rating for frontal crash avoidance is valid only when equipped with optional automatic emergency braking. It’s included in the $2,250 Driver Assistance package, available only for upper trim levels. The IIHS deemed standard MKX headlights Poor, while adaptive LED headlights in the Driver Assistance package were considered Marginal. Lincoln’s Driver Assistance Package also includes active lane control, adaptive cruise control, and automatic emergency braking with pedestrian detection. Externally, the MKX boasts several luxury-vehicle elements – but lacks a few other indicators of poshness. Premium upscale, for sure. Yet, considering its price, Lincoln’s MKX doesn’t quite reach far enough into full-luxury motoring. While sharing engines and its foundation with the Ford Edge, the MKX differs considerably in appearance. Details stimulate delight, highlighted by the Lincoln’s voluptuously curvaceous shape. Modest application of chrome trim sets the right tone. Comfortable and expressive, the MKX cabin feels admirably upscale. With its large dashboard elements, the cockpit breaks defiantly away from its Ford Edge cousin. Instead of a traditional gearshift lever, Lincoln’s crossover employs pushbuttons along the center stack to change gears – an exercise in frustration. Seating space is ample for four occupants, but a fifth might feel cramped. All MKX versions feature heated power front seats that adjust 10 ways. With its standard adaptive suspension and relatively long wheelbase, the MKX blends satisfying ride comfort with composed handling prowess. European crossovers might promise sharper responses, but few drivers are likely to feel shortchanged. Less efficient than expected, the MKX falters in fuel economy. With front-wheel drive, the base 3.7-liter V6 is EPA-rated at 17/25 mpg City/Highway, or 20 mpg Combined. All-wheel drive drops the estimate to 16/23 mpg City/Highway, or 19 mpg Combined. In addition to a classy cabin, the MKX promises a somewhat athletic road feel. Except for synthetic leather and matte plastic trim in the base model, each version feels appropriately posh, topped by the more costly Black Label edition. Most advanced safety technology is optional, and extra-cost features can send the total price upward in a hurry.